Switzerland is high up on lots of people’s go-to lists. Easy to understand why. Besides the scenery (which on its own is worth making the trip for) and the nonpareil skiing in winter, there’s the food and wine and the fresh mountain air. And of course, it’s Europe, so it has history—beautifully preserved—all around. What particularly attracts me to this part of the world is the opportunity for non-winter outdoor adventures. Here’s a sampling of activities you might want to consider for a quick getaway this fall or late next spring or summer. Throw a dart at the map of Switzerland and it will inevitably land on or near a beautiful area for hiking. One of my favorites is in the Lake Geneva Region. Villars, which is a popular family ski destination in winter, has all the elements you’d want in a memorable hike: whoa-this-can’t-be-real views, challenging though not intimidating paths, alpine flowers everywhere you look and a special reward along the way: a mountain restaurant serving delectable Swiss and French specialties. 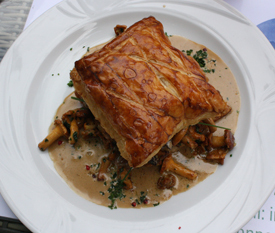 Pictured here is just one dish you might want to dig into: sautéed forest mushrooms in a savory morel sauce betw een flaky pastry halves. 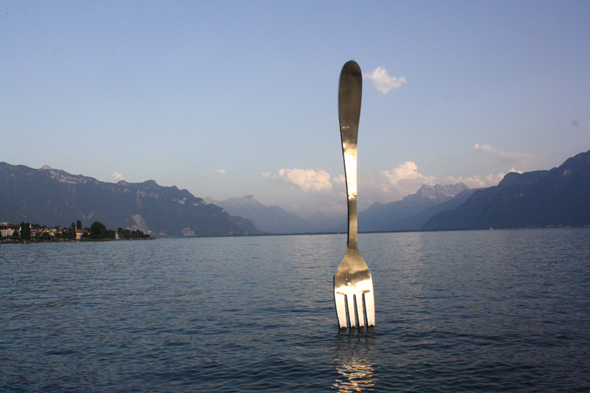 A great base to explore this area and beyond is the nearby town of Vevey, where you’ll find this giant fork (pictured above) embedded in Lac Léman (the Swiss name for Lake Geneva). The 26-foot-high utensil (made of stainless steel) was designed by Swiss sculptor Jean-Pierre Zaugg. Can’t imagine biking in the Alps? Then you’ve never pedaled an E-Bike before. While they look and feel like regular bikes, these marvels--with their electronically powered boosters--give you a little edge, when it comes to ascending the country’s mountain slopes. 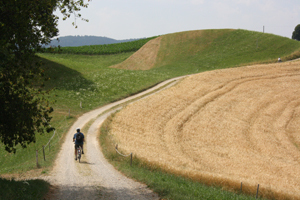 A great way to experience the pleasures of an E-Bike is on a day trip from the Swiss capital of Bern. Take a train out to the Emmental region (home of Swiss cheese as we know it). Right near the platform in Burgdorf, you can pick up E-Bikes along with a mobile d evice and app that has the Cheese Route mapped out for you. Within minutes, you’ll find yourselves whipping through the storybook countryside, passing one quintessentially Swiss village after another, before reaching the Emmentaler Show Dairy. Here you can see how the cheese is processed before sitting down for a we-can-afford the calories raclette. Later, back in Bern, you can top off the day by joining locals who have one of the world’s most exhilarating commutes possible (summer months only). 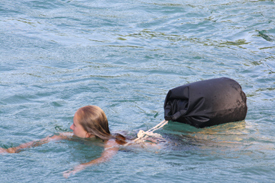 Once the work day ends, they strip out of their business attire into bathing suits, cram it all into an amphibious bag, hurl themselves into the fast-moving River Aare and let it take them to the stop of their choice. While you can easily spend plenty of days exploring the city of Lucerne itself, one of your most memorable days in central Switzerland will be when you head out of town to visit Mt. Pilatus. You can take a boat right from a pier in town to Alpnachstad, where you then climb aboard the world’s steepest cog-wheel railway to ascend Pilatus Kulm (48% gradient). It takes you just below the highest peaks (nearly 7,000 feet) which yo u can hike up, keeping an eye out for the ever-so-quiet alpine ibex and chamois that stand like statues when noticed. 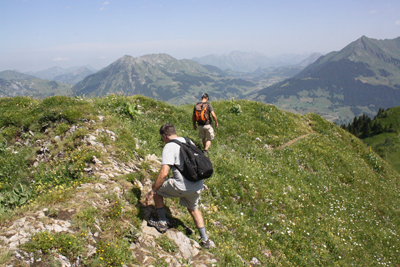 And if you’re not into wildflowers, you will be after following the flower trail to Tomlishorn. It’s hard not to fall in love with these intricate beauties that not only survive but thrive in the rocky landscape. When hunger strikes, break for traditional Swiss rosti (mostly potatoes and butter with fried eggs and bacon) on the mountain's viewing terrace. From this perch, you won't be able to take your eyes off the voluminous peaks all around and Lake Lucerne in the distance. 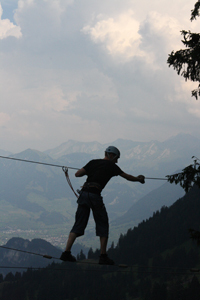 Afterwards, ride the cable car down to Fräkmüntegg, where acrophiles can test their skills at Seilpark Pilatus, central Switzerland's largest suspension rope park. If the sheer sight of the elevated exercise trails with ladders, platforms, cables and log bridges scares you off, choose instead the thrill of speed on Switzerland’s longest summer toboggan run, which shoots down 4,429 feet to the lower slopes of Mt. Pilatus. You finish your action-packed day with a gondola ride down the mountain and a bus ride back to Lucerne. Want Help Planning Your Trips? Not planning a trip right now? Sign up for our e-letter (top of this sidebar). We'll keep you posted on our new stories and savings.